Some people think that children railway is just a toy, a little steam engine and cars with a remote control. It is not really true. Children's railway is a narrow-gauge line with real trains and stations. Children in the age of 9-15 years old work on the railway as machinists, train-drivers, conductors and so forth. All summer long, supervised by experienced professionals, they drive trains, take care of the cars and transport passengers. All year long children study the basic principles of railway functioning and hone their skills of working on the railway, so that in summer they could demonstrate their abilities and acquirements. Children's railway line runs for several kilometers and doesn't adjoin the main railway line of the country. Usually such railways are used not for public transportation, but as attractions and traveling along parks and rest zones. Still, children railway station is a very good school for kids. When they grow up, many of them continue working on the railway. 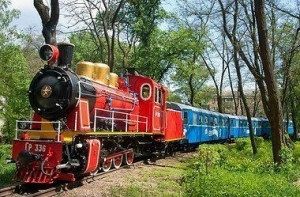 Kiev children's railway is located in the Sirez Park, a cozy and picturesque place of the city. The Sirez Park was named after the Sirez River that flows into the Dnepr. Sirez was first mentioned in chronicles in 1381: it used to be a village presented by Prince Vladimir Olgerdovitch to the Dominican monastery. In the first half of the 19th century Sirez became a part of Kiev. It was a farmland that gradually turned into the place for Kiev garrison summer camps quartering and military aerodrome. During the World War II Sirez became a tragically known concentration camp, where the Nazi kept their prisoners. Nowadays Sirez is a housing estate with a beautiful green park in the middle. Children railway functions in the park and consists of Pioneers' platform and two stations, Yablonka and Vishenka, which mean Apple tree and Cherry tree. Kiev children's railway was built in 1953. It took three years to construct it: originally it passed through the vacant lot near Babiy Yar and was 8 kilometers long. After some time it was shortened and became just 2,8 kilometers long. There is an additional line that passes through the forest in the middle of the park and serves for the trains' turns. Soon the locomotive depot will be built, so that the trains will be protected from precipitations and vandals' loots. The circular line of the railway passes through the dwelling houses, well-room, hospital and ravine. The route boasts a grand construction, which is the bridge through the ravine. Its length is about 100 meters, and its height equals 20 meters. In 2001 the railway was reconstructed and repaired. Now each trip by railway train takes about 10 minutes. The season starts on May 2 and ends on the last Sunday of August. The railway functions from 11:00 till 16:00.